My question is… Where can I go to find out about tie-ins being done all in line with each other and not staggered / spaced out as they should be. I am having trouble with my Mig welders making their welds all the same length and not staggering / spacing there stops and starts out. I need physical evidence in black in white to show them in a meeting I am having on Tuesday. It is understood throughout the industry that most weld defects are attributed to weld stops and starts. We automate (or change from manual to semi-automatic) for the purpose of improving cycle time and quality. Most of that quality improvement comes from the elimination of starts and stops. Starts in welding can lead to overlap, incomplete fusion and slag inclusions. Stops typically lead to cracks and undercut. Some of these discontinuities may be considered acceptable but stacking them on top of one another in a multi-pass weld is just “flurtin’ with disaster”. Stops and starts are a necessary evil in welding. We can minimize their negative effects through techniques during manual welding, and through weld data settings for semi automatic and automated welding. Adding a burn-back to keep the wire stick-out as short as possible to help with your next arc start. Adding a post-flow (3.0 sec) to insure the tip of the wire is kept protected and clean. Adding a pre-flow (0.2 sec). 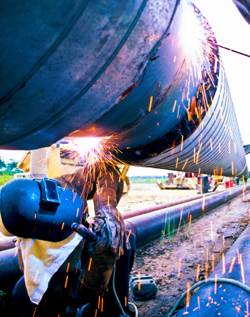 This insures shielding gas covers the area before an arc is struck. Adding a slow run-in speed (-100 to -200). This will reduce the “Snap” that often occurs when initially striking an arc. Increased start voltage (1-2 volts). This will also reduce the “Snap”. When striking an arc, start out ahead of the desired start point (1-1/2 x the weld size). When the arc is struck, backup quickly to the desired start point then begin your weld. This will almost eliminate any overlap (cold lap) that is common with weld starts. When extinguishing the arc, weld to the desired stop point then back up (1-1/2 x the weld size). This will fill the weld crater, slow the cooling rate, fill the undercut and reduce the chances of a crater crack. You could probably search the internet for an article on weld stops and starts and get plenty of horror stories. In that same search you will find oodles of “pixie dust” salesmen with a simple wire/shield-gas/power source that can take all those troubles away. Stick with common sense. Set up your feeders with the settings that help improve weld starts and stops, and teach good welding techniques. are covered at this point. What you are talking about is called a Continuity Report or Continuity Log. AWS D1.1 Clause 4.2.3.1 - Tells us that a Welders qualification is effective indefinitely as long as that Welder does not go more than 6 months without using that process. ASME Section IX and most Welding Codes make similar statements. We are required to provide documentation showing that the welder worked with all the processes (GMAW, GTAW, FCAW, SAW…) he/she held qualifications in, from the time qualification testing was complete to today with no gaps in service greater than 6 months. I did a word search of "continuity" in D1.1 and got about a million hits for “discontinuity”, but zero for “continuity”, so it looks as though you are on your own as to how you maintain that documentation. I've worked for several organizations and each has had different ways of doing this. I've maintained a simple Access Database where every 5 months I would go out on the shop floor and verify that each Welder is welding with the process they are qualified in. I would then log the employee ID, the process and the date. I've worked with local unions (http://www.pf597.org/) who would maintain these records for their members and provide me, the contractor, copies with a clear trail and no lapses greater than 6 months. Today I have a software program that will generate a list of Welders by Plant Location, Department & Supervisor. I forward those lists to the Supervisor every 5 months and they return them with the updates. I update my database and I also sign and keep their hard copy. A welder enters active military service and then returns to his/her civilian job 9 months later. A Welder takes a Supervisor job, but a year later decides to go back to welding. A GMAW (Mig) qualified Welder takes a job running a Submerged Arc Welder (SAW) for 7 months, then returns to Mig welding. 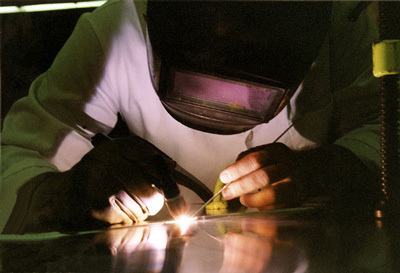 A Welder in a job shop may seldom uses one or more of the processes he/she has qualified for due to the shops work load. All of these are common scenarios that have snuck up on me at different times in my career. It's a pain in the neck, but a Welder Qualification is of no value without an unbroken Continuity Report. That is the thing that will sting you in an audit. Showing a clear line from the date of qualification testing to today with no break greater than 6 months is required per most welding codes.